There was no effective treatment for uncontrolled, difficult, and sometime painful movements associated with movement disorders. That is, before the development of deep brain stimulation (DBS) techniques. 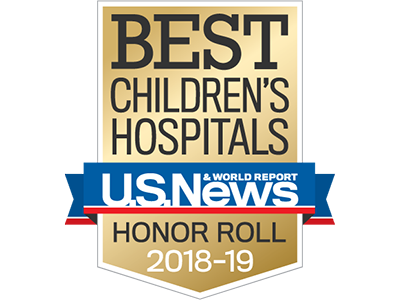 Children’s National Health System is one of only two children’s hospitals with fully integrated DBS programs. 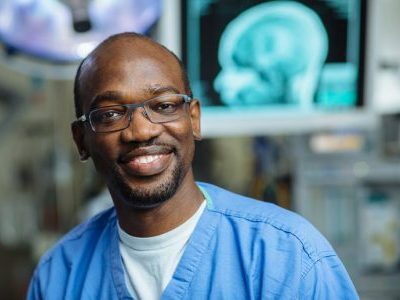 Chima Oluigbo, M.D., who leads the pioneering Deep Brain Stimulation Program within Children’s Division of Neurosurgery, is one of few pediatric deep brain stimulation experts in North America and cross-trained in pediatric and functional neurosurgery. 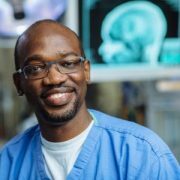 Dr. Oluigbo says the effects of DBS are often dramatic: 90 percent of children with primary dystonia show up to 90 percent symptom improvement. A 6-year-old boy with dystonia so severe that his body curved like a “C” was one of the first patients to undergo the procedure at Children’s National. Six weeks later, he gained the ability to sit straight and to control his hands and legs. He also was able to smile, an improvement that brought particular joy to his parents. Patients with movement disorders experience difficulties due to neurological dysfunction that impact the speed, fluency, quality, and ease in which they move. In these cases, neurons in the brain’s motor circuits misfire. 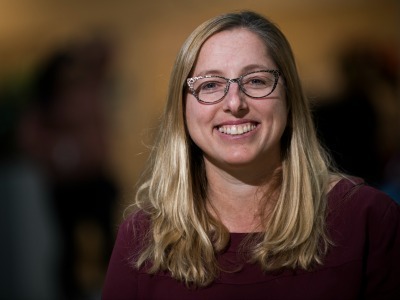 Through the use of DBS, neurosurgeons can synchronize neuronal firing and accomplish the previously impossible: restoring muscle control to patients with these disorders. 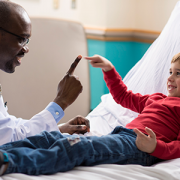 Movement disorders are common in children. “It’s not just numbers, it’s also about impact. Think about the potential of a child who is very intelligent and can contribute to society. When that child is not able to contribute because he or she is disabled by a movement disorder, the lost potential is very significant. It has an impact,” Dr. Oluigbo says. Imaging: Magnetic resonance imaging (MRI) helps pinpoint the area of brain tissue responsible for movement disorders and informs the treatment plans. 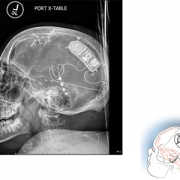 Neurotransmitter implant procedure: Using minimally invasive neurosurgery techniques, doctors access the brain through a tiny incision in the child’s skull and place thin, insulated wires (leads) in the area of brain tissue responsible for the condition. Pulse generator implant procedure: The pulse generator (neurostimulator) is a battery-operated device that sends low-level electrical impulses to the leads. During a separate procedure, the pulse generator is implanted near the child’s collarbone. Leads are threaded under the child’s skin to connect with the pulse generator. Stimulation treatments: Once the leads and pulse generator are connected, the child receives a continuous stream of electrical impulses. Impulses are generated by the neurostimulator, travel through the leads, and end up in the deep tissue of the brain. Here, they block abnormal signals that are linked to the child’s movement disorder. 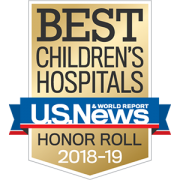 Follow-up care: The child will likely need deep brain stimulation throughout his or her lifetime to make sure the device is working correctly and to adjust the neurotransmitter settings to meet his or her changing needs. 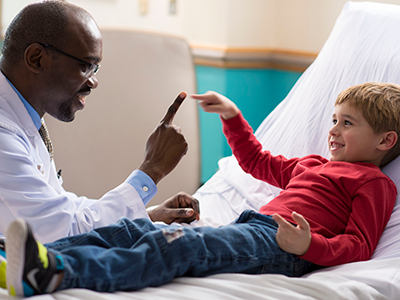 Children’s National is currently conducting clinical trials seeking to expand the use of this procedure to patients with cerebral palsy, one of the most common dystonias. 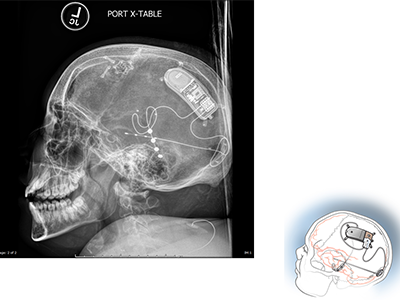 The effective use of deep brain stimulation requires ongoing attention from a multidisciplinary team (from neuropsychology to rehabilitation medicine), giving seamless care under one roof. There is evidence to suggest that this technique could be used to aid people with memory disorders, patients in minimally conscious states, and patients with incurable epilepsies.